Each black granite brick ordered will be shipped, once completed, directly to FBR to be placed in their new walkway. 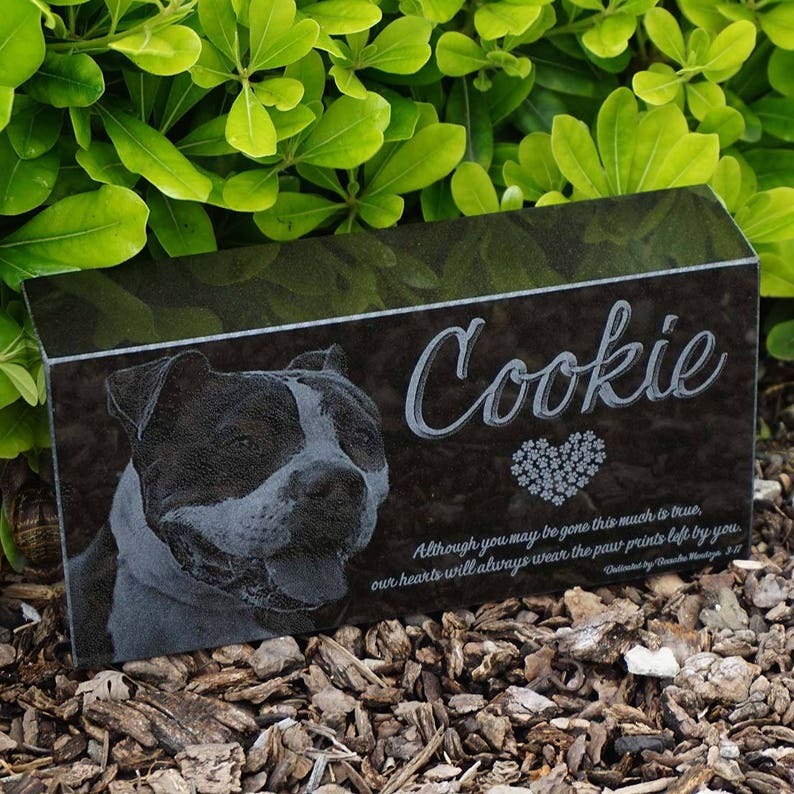 This beautiful memorial will be on display with your pet or loved one's photo and information, of your choosing. Granite is the best choice for outdoor application, as the stone's natural composition can help defend itself against scratching, acids and other outdoor occurrences, lasting a lifetime. The marker's physical dimensions are 4" x 8" x 2" which will be engraved with the photo of your choice, as well as any text that you would like included such as; name, dates or quotes. We will also include the donor's name, as well as the month and year the brick is donated. The final picture in this listing is a actual artist proof that would be sent back for the approval prior to the engraving process taking place. Please be advised that photographs are taken of all engraved products, to be used on ArcLight Laser’s website, social media accounts, marketing materials and Etsy Shop. By placing your order, you consent to ArcLight photographing and using your (product’s) image and likeness. If you would prefer your personally engraved item NOT be used in such a way, please let us know. Due to the artwork involved and the approval process a shipping time of 10-14 days from receipt of order would be needed. Stacey was amazing to work with! She went above and beyond what I expected! My husband and I are excited to add our boys headstone to his garden! 👼🏻💙 Thank you giving us some joy during this difficult time as we celebrate his 1st Birthday!! She did a wonderful job on our beloved friend's Memorial headstone ! Great communication. She is very professional. She does amazing work and i would highly recommend this to other friends and family. ArcLight Laser customers can pay online. Each item is made ONLY AFTER you place the order for YOUR personalized item. Refunds and Exchanges are made on a case by case basis. Payment must be made before I process your order. I will gladly accept the return of products that are defective due to defects in manufacturing and/or workmanship that is my error, upon receipt. Fulfillment from mistakes that I make resulting in the shipment of incorrect product to you, will also be accepted from the date of purchase. Shipping Time -- I produce custom products and usually ship 10-14 days after receipt of an order. I will expedite your order at your request (including a RUSH fee) provided I have the stock for your engraving, in which case I can ship most products 1-2 days after the proof approval. We do not ship Saturday or Sunday, except by prior arrangement. Shipping via USPS Priority Mail and sometimes UPS (unless otherwise requested). If you have the need for alternate shipping, please contact the shop and I will be happy to accommodate your needs, which will be charged separately. Any problems uploading a picture, or questions about a custom order, please call us at: (209) 715-2444. Have a great day!